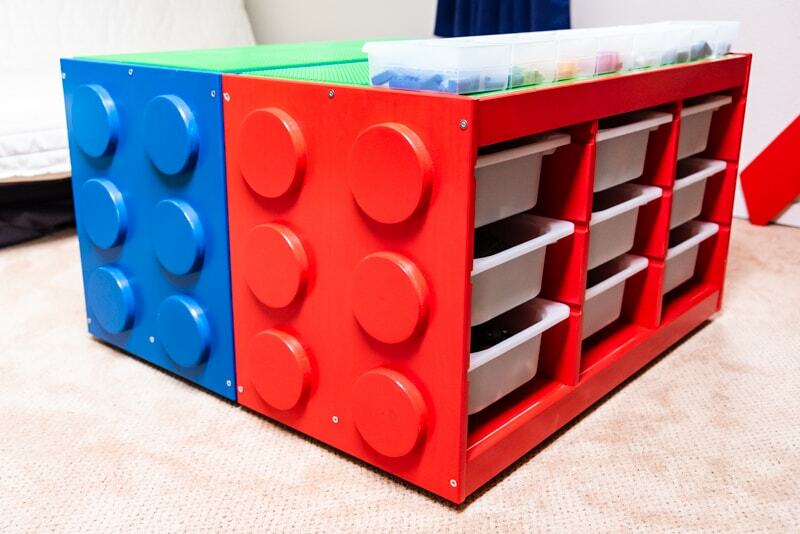 This DIY Lego table with storage is perfect for your little master builder! 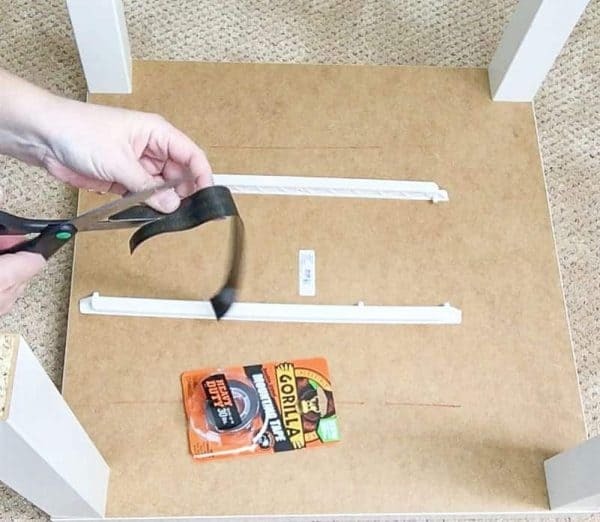 Uses IKEA Lack side tables and Trofast bins for a cheap and easy project anyone can make. 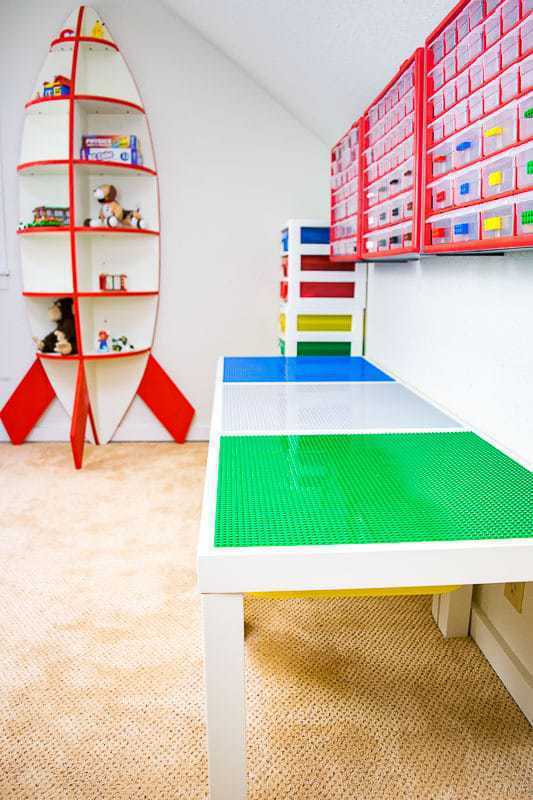 Does your kids’ playroom look like a Lego store exploded? I know ours did! Pieces and partial builds were scattered everywhere, making it hard for our son to play with the toys he loves so much. As soon as I finished this DIY Lego table, he was hard at work creating an entire city! This post contains affiliate links for your convenience. Purchases made through these links may earn me a small commission, which helps keeps this site running! I’ve added a new IKEA Lego table to the room, and it fits a TON of Legos! 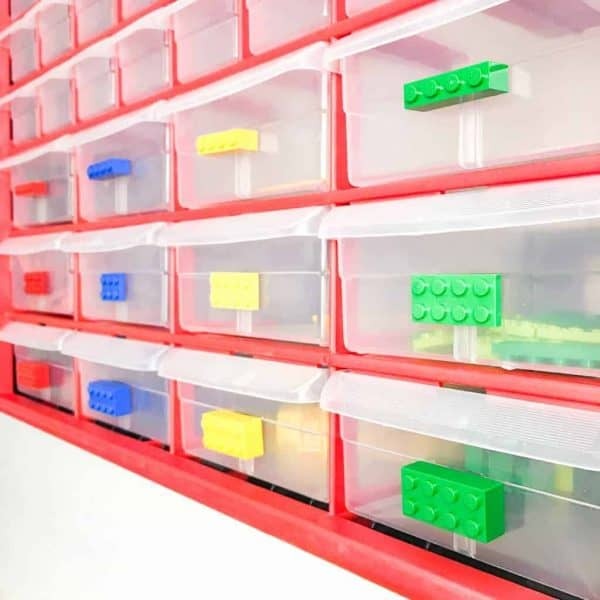 I’ve written about Lego storage solutions before, and this year I kicked it up a notch! 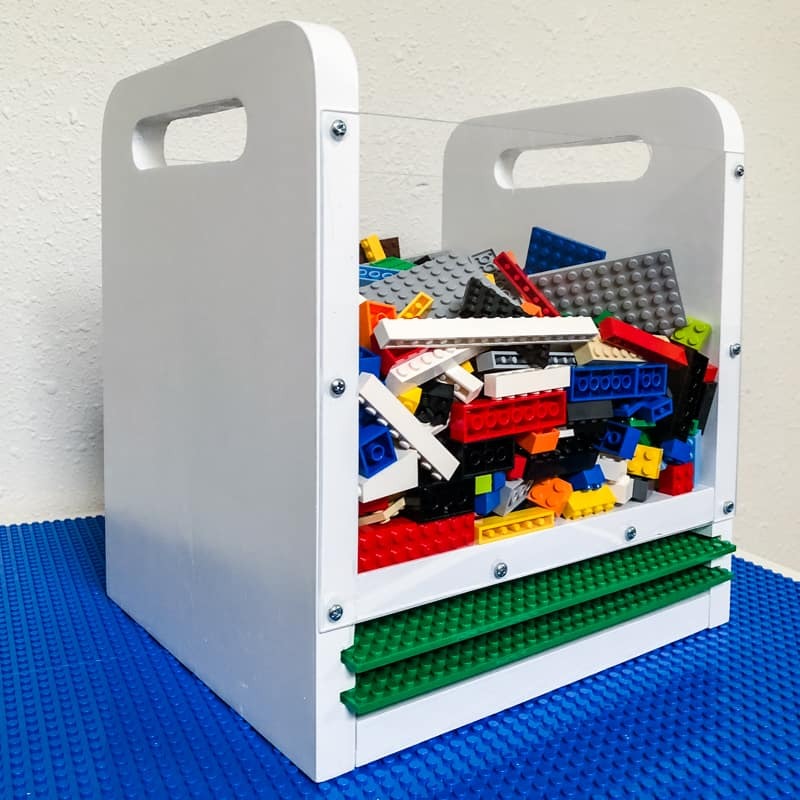 I made this clear sided Lego bin to make it easier to find that elusive piece at the bottom. 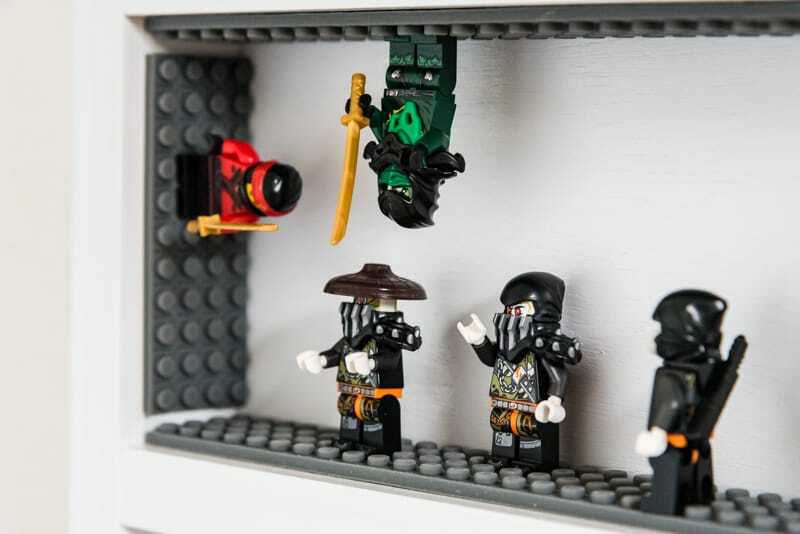 And his favorite characters are displayed on the wall with this fun DIY Lego minifigure display case! When he’s finished, he can display his creations on his rocket bookshelf! 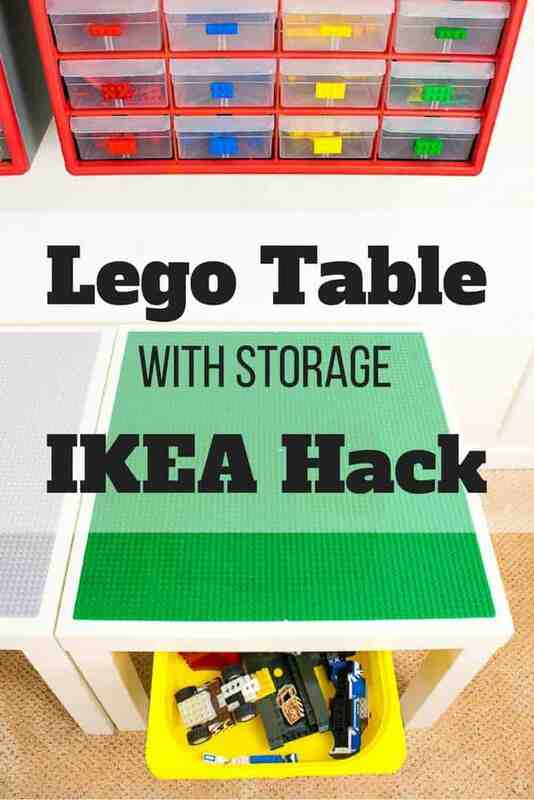 Now it’s time to make the ultimate Lego table! Ask customer service at IKEA for the drawer slides. I got mine for free! 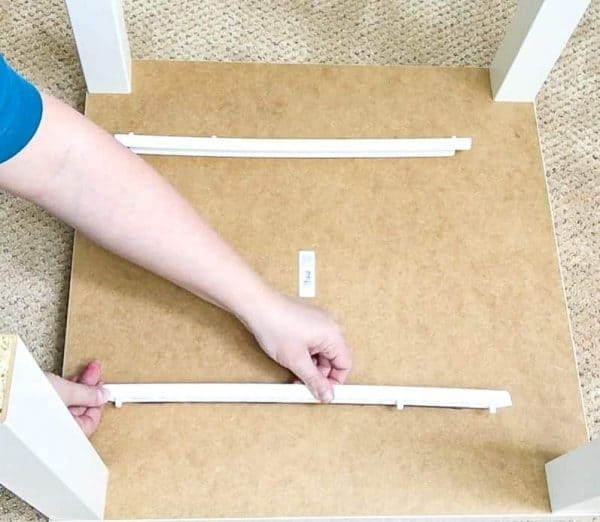 If they don’t have them or won’t sell them to you, try using the IKEA Sektion suspension rail instead. I’ve heard the lip of the bins fits perfectly, and the holes make it easy to screw to the underside of the table. I bought two packs of these off-brand base plates, which was enough for three tables. Before you start, be sure to check out my video of the process below. 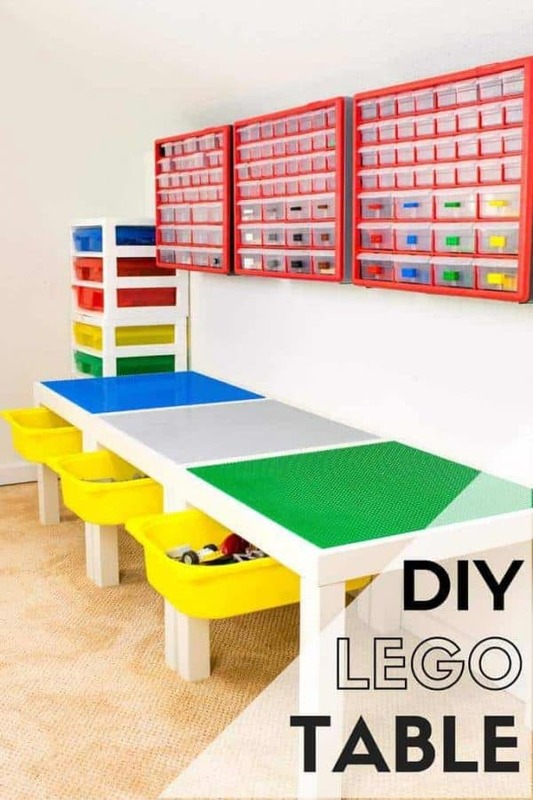 It really is this easy to make your own DIY Lego table! 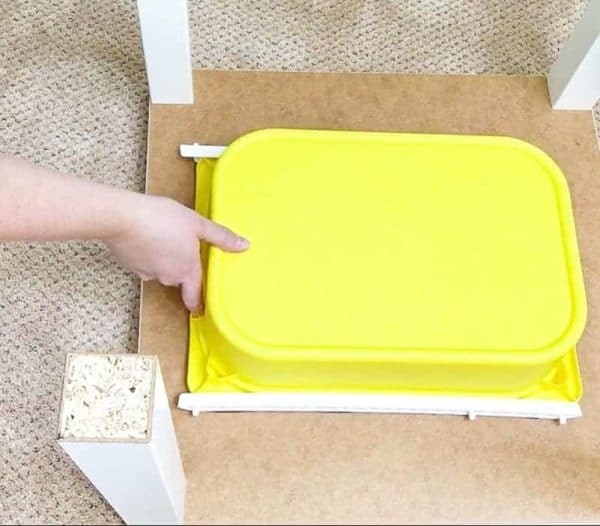 Flip the IKEA Lack table over and place the IKEA Trofast bin upside down, centered on one side. Slip the drawer slides under each side of the bin and mark their position on the outside edge. 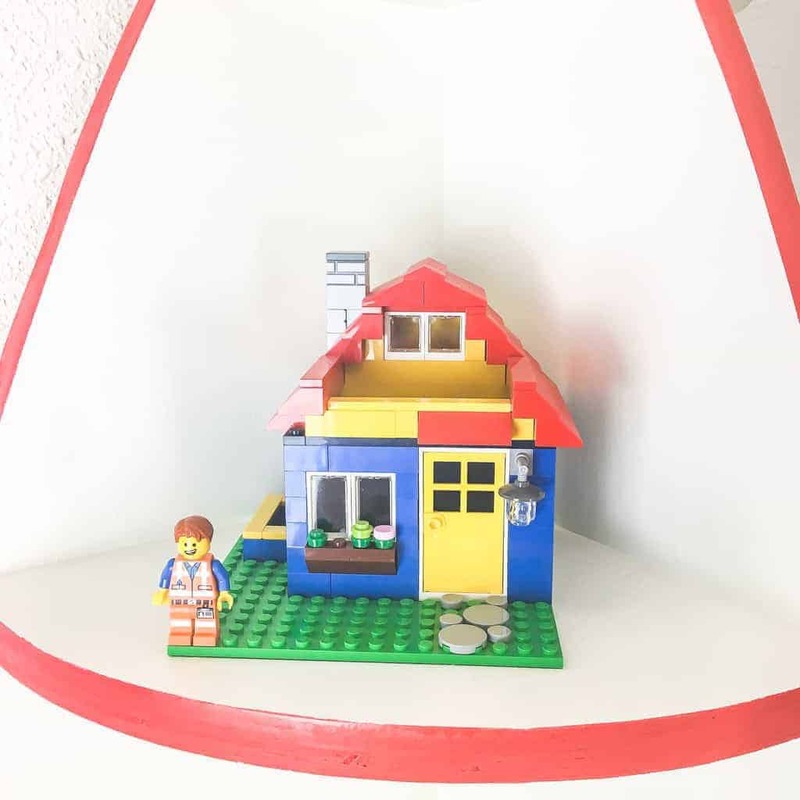 This heavy duty double sided tape is rated for up to 35 pounds, which is a lot of Legos! Cut a strip in half, and stick it to the thinner side of the drawer slides. Peel off the backing and attach the rails to the underside of the table along the markings. Press and hold them in place for 15-30 seconds so they adhere properly. Test to make sure the bin can slide freely without falling out. Then flip the table over. Don’t want to attach the bin yourself? 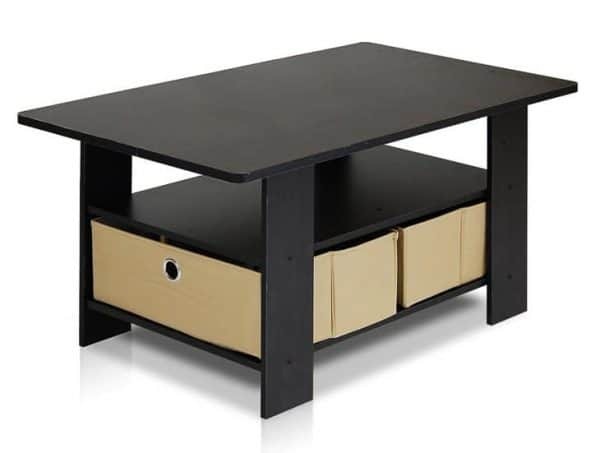 Try this inexpensive coffee table option instead! Mark the center of the table, then arrange four base plates around it. Mark the outside corner of each plate, so they’ll all be straight when you glue them in place. Glue the back of each of the base plates, then place them on the table at your marks. 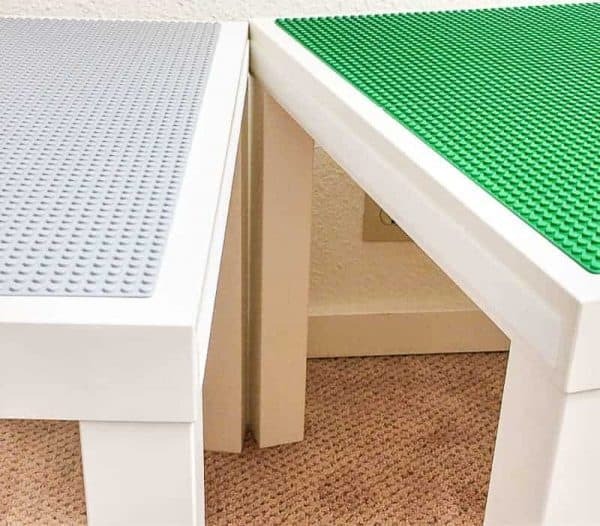 Use Lego pieces to connect the plates with the correct spacing in between. 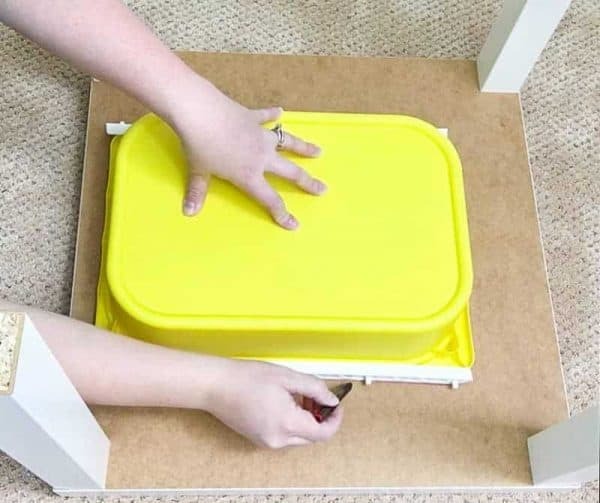 Place something heavy on top of the plates while the glue dries. I applied adhesive Velcro to the sides of the tables to hold them together. Now he can change up the order of the colored base plates to suit his creations. The low profile Velcro creates less of a gap between tables where small pieces can get trapped. And the industrial strength gives the long row of tables better rigidity, which is important when you’re building a skyscraper or ninja fortress! I bought one of these small part bins a few years ago, and it was great for keeping everything organized. But without a label to identify what was inside, those pieces were quickly forgotten. I used the same double-sided tape to attach one Lego piece to the front of each drawer. Now he can grab what he needs and keep building! 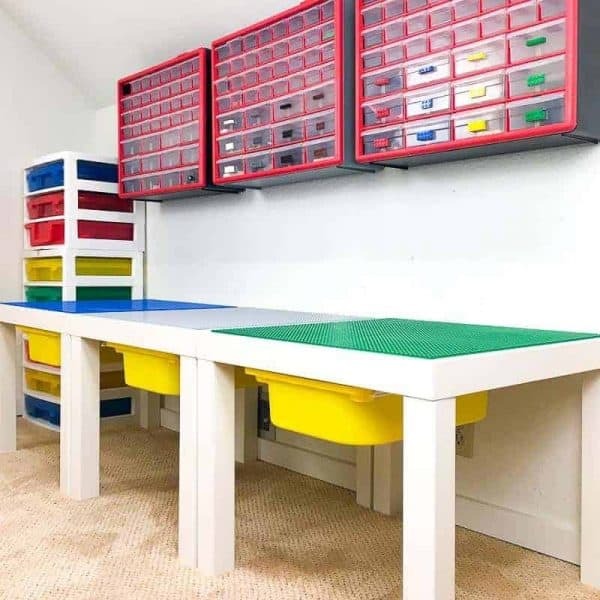 I attached each bin cabinet to the wall above the Lego table for easy access. Sorting all his pieces into the correct bin is a work in progress! Loose pieces get tossed into the drawers underneath to be sorted later. Full sets that have been disassembled are kept in the bins of the storage tower in the corner. He prefers to sit on the floor to play and build, so I didn’t bother with chairs. Small ones like these should be able to fit underneath without a problem. I just LOVE the bright colors in the playroom! I’m glad we kept the walls white so the colors really pop. Within minutes, my son had put together all his Lego buildings into one massive city! 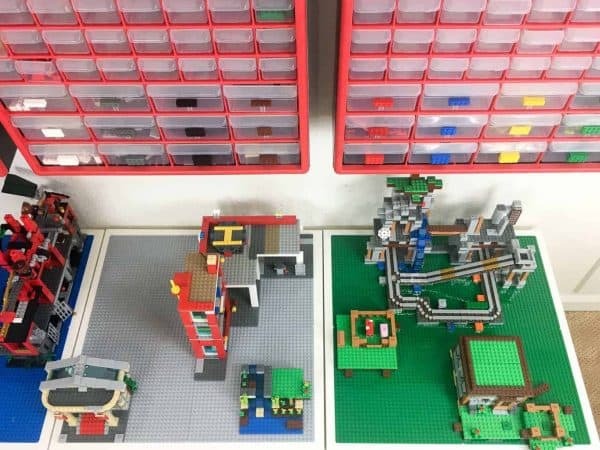 Where else can you find a Ninjago temple, fire station, museum and Minecraft farm all in one place? If you would like to keep up to date with my latest posts about woodworking, DIY decor and more, you can follow me on Facebook, Pinterest, or Instagram. You can also sign up for my email list below and get access to the plans in my woodworking plans library! Love this! I don’t have kids, but I do have legos. I need to make one of these. I love this solution! As a mom of three boys I have spent many hours sorting legos and applaud your organization! I love the table design – well done! Thanks! I’m not sure how long the organization will last, but hopefully at least some of the pieces will end up back where they belong! I went to my IKEA and hey do not sell the slides separately. Other suggestions?? I went to the customer service counter at IKEA and asked if I could have a few TROFAST drawer slides, and they gave them to me for free. I did a little digging and it looks like you can find a similar U shaped channel like this one at Home Depot. Just cut it to the length of the bin and apply as I did to the rails. Hi – I like this storage idea. Do you have any info on your red and clear wall mount storage bins? You can find them here. There are a few different configurations and colors available. 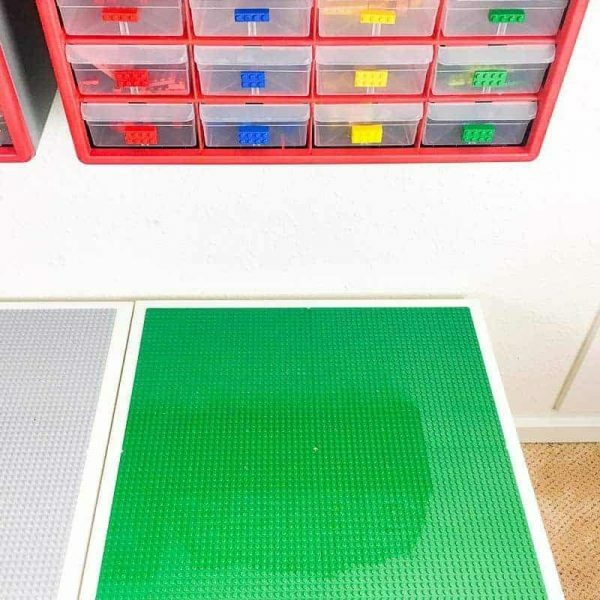 I have to tell you that I have made many portable wooden lego trays in all different sizes and my littles LOVE them, but this is genius! 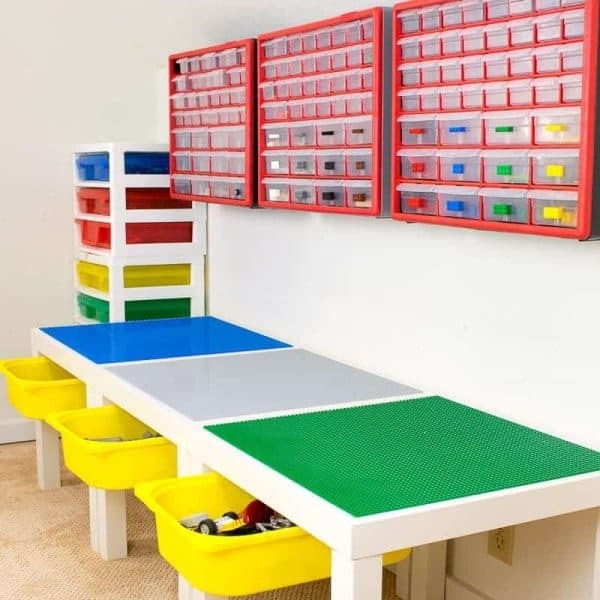 I’ll be calling all the moms to see who wants a lego station in their house. I have to make one. Thanks for sharing! What an amazing project. What kid wouldn’t want their own table. So nice and neat. I tried organizing my son’s Lego so many times and I finally gave up…lol. He has them in large bins and just digs through them, but I would prefer if it looked more organized like this. This is such a cool setup, I am really impressed! My daughter would be in heaven! This is really amazing. Wish I’d had this tutorial when my boys were small–I’d have been on my way out to buy the components before you could blink! Really fun project, Vineta! I pinned to my Crafts and Sewing and also to my DIY Projects boards for you. No grandkids yet, but maybe one day this will be a project for my son and his family. 🙂 Stopping by from WoW at Savvy Southern Style. 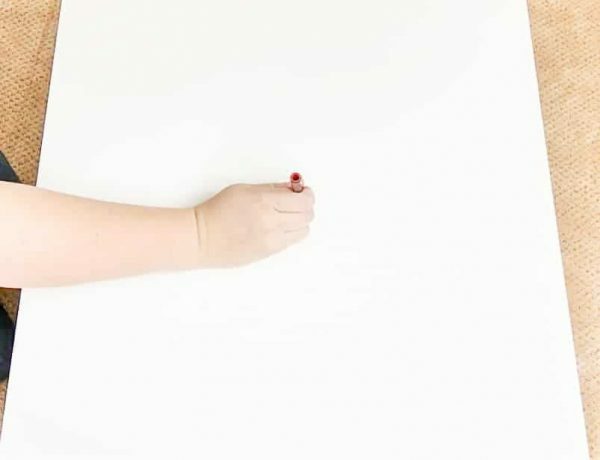 This is stylish, practical, and a great DIY for the home. I will be featuring this in my 16 Stylish DIY Home Decor Ideas at Merry Monday on Sunday at 6 pm pst. Hope to see you at the party! Where did you find the drawer slides?! I love this! I got them at IKEA. They’re usually included with the Trofast furniture line, and you can ask for just the drawer slides from customer service. Where did you find the colorful storage bins to the far right? IKEA would not give or sell me any drawer slides. I sent my husband to Homedepot to get the ones you suggested and he doesn’t want buy them. He says they are super flimsy made to hold electrical wires and there is no way they will hold the drawers full of legos. Any other suggestions? I already bought the whole set up and it’s ready to be built I’m just stuck on the drawer situation now. Thank you for this idea, I have just made one of these as a Xmas present for my 2 year old who loves his Duplo. I was glad to see that Duplo is also compatible with normal Lego so I decided to use normal Lego base plats allowing the table to last him longer when he starts using normal Lego. I filled out a spears form on Ikea’s website and they emailed me to say that two drawer slides had been posted out direct from Sweden. You realy can not fault their customer service. I also ordered some soft bumper edging for round the side from eBay just in case he falls in to the table. Wow, that’s great that they’ll ship out the drawer slides! 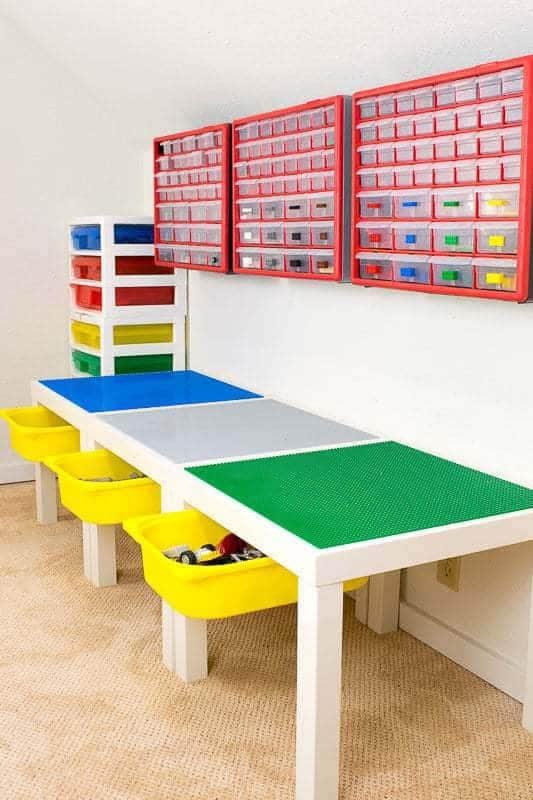 Hope your son loves his new Lego table!